Collectors come in all types and temperaments. Just the idea of “collecting” conjures up mental pictures of rooms filled with stuffed bears, Star Wars characters “in their original packages” and hermetically sealed and signed baseballs. Collecting is a national epidemic. Some people collect for money and some collect for love but once the “I need to have ‘em all” bug bites, whether it’s bears, Chewbacas or baseballs, there is no turning back. The passionate collector becomes blessed or burdened with a generous mixture of obsession, competition and a dash of greed, usually in that order. Although they qualify for all of the above, plant collectors are a little bit different. Yes, they are obsessed. If seeking out the latest horticultural wonders is competitive, they’re also competitive. Greed, however, is replaced by an overwhelming desire to share their bounty. Entire gardens have been created with “pass-along plants” from passionate, generous plant collectors. One such plant collector is Erik Ortengren. Erik is a self confessed plant nut and collector of unusual and rare plants. As a boy of 10, Erik was bitten by the plant bug when living near the water in Gig Harbor in the 1970’s. The house faced the water and had a steady parade of avid boaters. Many houses placed containers of flowers within easy view of the boats, all perfectly acceptable. Erik put together a few containers for his Mom and the boaters complimented “the kid in the honey colored log house” for a job well done. That did it. First of all, he enjoyed the process of putting everything together and second he got an added bonus for his efforts, immediate and very positive feedback. iA plant nut was born. 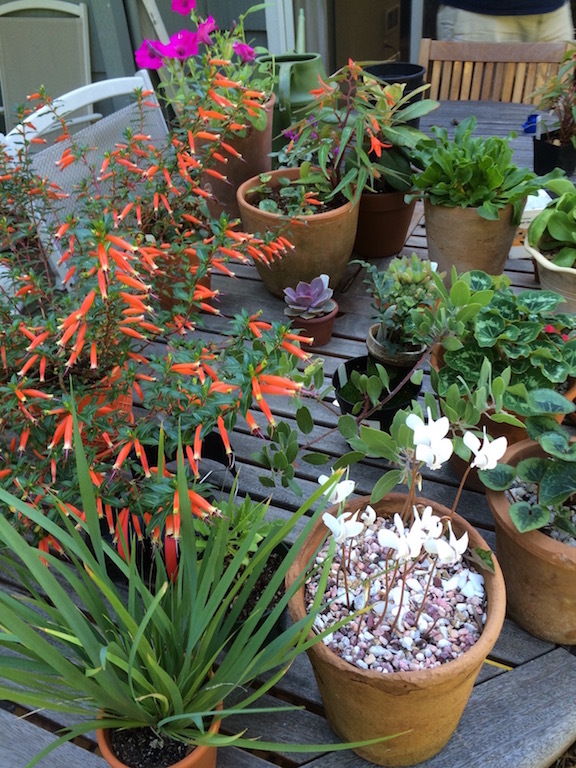 Plant collectors run the gamut. Some collect only roses, dahlias or irises and some collect colors (blue gardens, white gardens, ). Some collect for history (Medieval herb gardens, early American gardens) and some will collect and go out of their way to get any new plant introduction. (This is where the competition and greed kick in ). Erik has his own criteria for what makes the cut in his garden. He goes for plants that do double and triple duty. His personal garden goal is to have year round interest; color in flower, leaf or bark 12 months of the year. This is not a low maintenance garden goal. It’s obvious that a lot of observation and close study are required and Erik pours over books, magazines and catalogs to learn as much as he can before he makes up his mind to add any new plants. His space is limited so he is a very deliberate and thoughtful gardener. His favorite reference is a catalog. The old Heronswood Catalogs (cleverly written by Dan Hinkley, plant hunter extraordinaire) are filled with unusually tempting and well-described plant material. Erik isn’t afraid of plants that offer a challenge. His favorite plants cover everything from bulbs to shrubs. Without hesitation, Erik will tell you that his favorite plant is the hardy cyclamen. And to prove that he is a patient gardener, he grows them from seed as he does many other small bulbs. . He has to grow from seed because they aren’t very easy to find as plants. As a matter of fact there are only 8 known species which makes it an ideal collector’s plant if you enjoy the hunt. 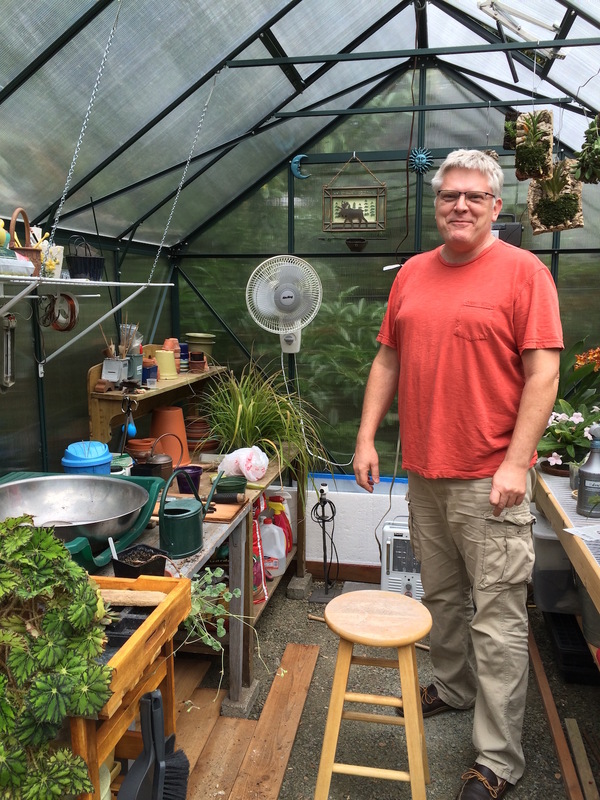 Erik’s home garden is tucked away in a little known part of Lakewood where neighbors share a swiftly running creek flanked by Northwest natives.. They all tend to let the wild be wild and cultivate the areas closest to their houses.